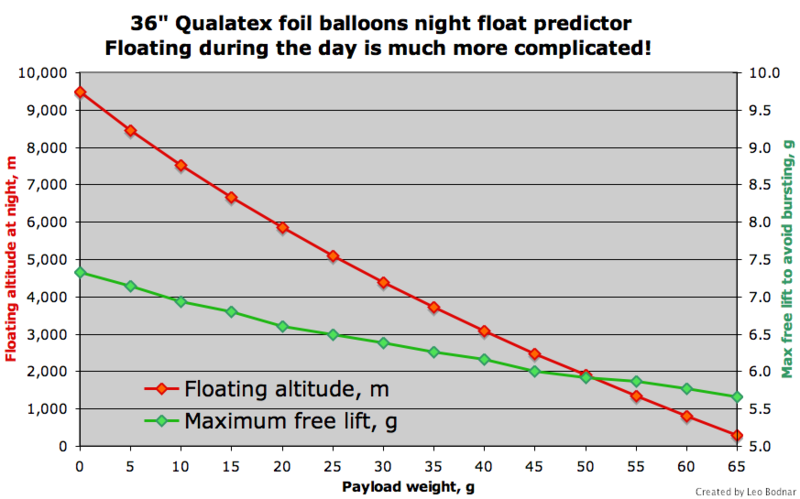 Collection of stats from microballoon flights in an attempt to understand the concepts of foil balloons and super-pressure. PicoChu-3 28/11/11 106 4×92 60 1.5 869m - - 1 n/a Presume burst, poor weather a factor possibly. Ozzie1 11/03/12 35 1×92 60 1.3 - 5000 27360 - n/a Lost contact in France. PicoChu-5 21/04/12 55 1×92 1×79 90 0.8 - 7.1 5319m - - 1.5 n/a Very unusual flight, payload was sucked into a thunderstorm cell and gained an ascent rate upto 7m/s at one point, failed to achieve float, landed on the MOD target range for tanks on salisbury plain, payload lost. BONZO1 07/05/12 100 3×92 >90 540m - - n/a Short flight to test tracker HW. 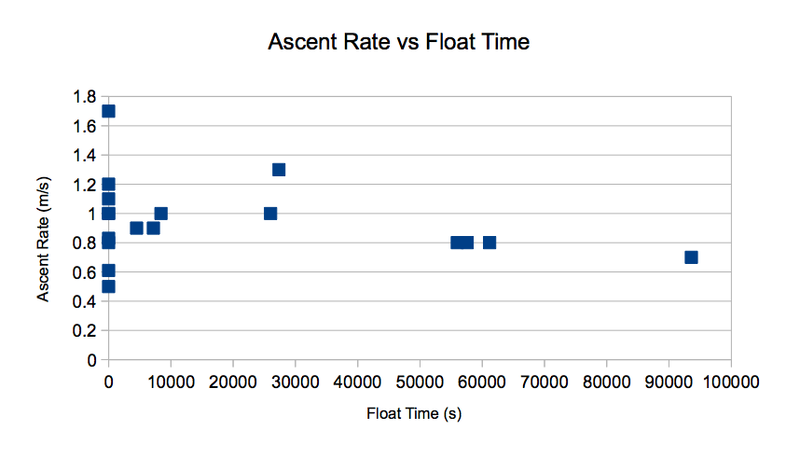 Assume overinflation od balloons, resulting in at least one early burst. Payload recovered less than 20km away, with two bursts. CRAAG1 10/10/12 35 1×92 - 1.7 4688 - - 6.7 17 balloon split at neck resulting in the payload descending rapidly with only the balloon neck and valve attached. CRAAG1-Camera 26/11/12 50 1×92 - 1.0 3190 - - 6 11 Payload caught in 15m treetop, not yet recovered. BONZO4 23/02/2013 80 2×92 ? 1.0 2256 No float - - 10g One foil burst and caught in tree nr. Blandford. Suspect overinflation and stress to neck whilst tethered for extended period awaiting GPS lock. BONZO6 14/04/2013 98 2×92 ? 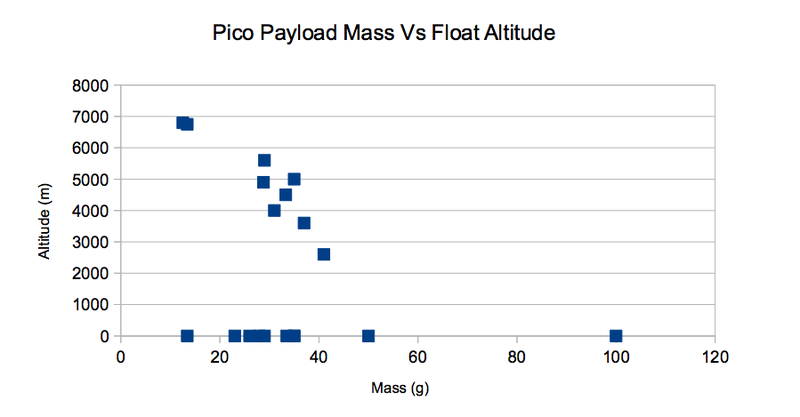 0.5(avg) 2018 No float - 0.61 ~3g Float attempt, burst due to heavy payload. No sigs heard from landing site. Lost. PicoHorus-2 20/4/2013 23 1×92 50%? 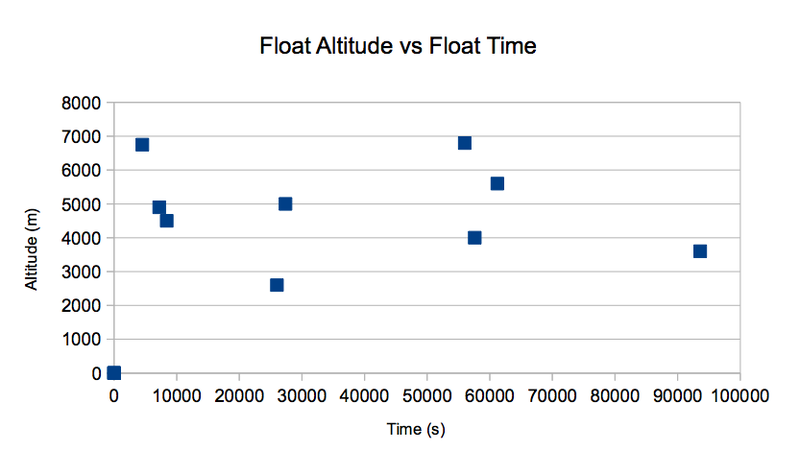 1.1 4930 No float - 0.5-1 29g Float attempt, small rupture at neck found on landing. Payload recovered. B-10 24/8/2013 10.7 1×92 47% 0.8 8300 7 hours 1.0 1.8g Solar power. Descended, rested on the ground, refloated again but brought down by rain. Recovered with original free lift. Descent reason unknown.